In TBC, it seems after a while wRobot just jumps to 15-30% CPU usage per instance. Only a full restart of wRobot solves this. I have tried with and without my plugin. I don't really understand why this happens, but on vanilla everything is fine. Observed in Quester product, have not tried others. Hello, in tbc all items seems to be keep in memory (in the objectmanager), when you go to big city (with a lot of players and a lot of items (equipped)) or after few hours you can get bigger CPU usages. Is there any way I can trigger a clean on the WoW ObjectManager? A /run ReloadUI() ingame does not work, unfortunately. Change continent (dead? logout?) seem to clean objectmanager. Can you try with the new update and tell me if this change something about CPU usage. Tested the update. 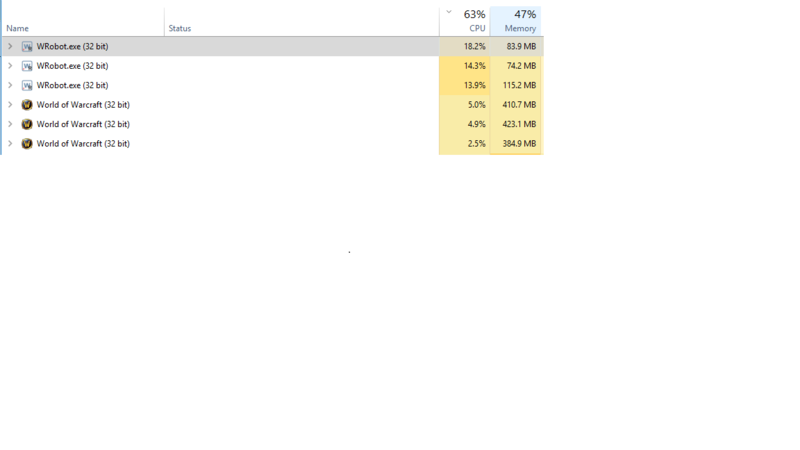 It gets to 15% CPU (maybe more if I let it run longer). Is there maybe some bug in TBC version? I cannot really imagine vanilla and wotlk objectmanager working so differently from TBC. Also using Quester product (FNV's logic). The CPU spike occurs when first logging into the product (License Keys Management Login), where it goes from ~4-5% CPU to 15-18%, even without running the actual quester code. [E] 13:41:31 - GetReqWithAuthHeader(string url, String userName, String userPassword): System.Net.WebException: The remote server returned an error: (400) Bad Request. [E] 13:41:40 - GetReqWithAuthHeader(string url, String userName, String userPassword): System.Net.WebException: The remote server returned an error: (400) Bad Request.